The National Golf Club is a private members club. Visitors from Interstate or Overseas are welcome during certain periods of the week. Such visitors will need to be members of a recognised golf club, with a current membership identification card or a letter of introduction from the home club. Contact Planet Golf for assistance with tee times. ‘The National will make me famous - either as the designer who has created one of the worlds great golf courses or a designer who stuffed up some of the best golf course real estate imaginable.' 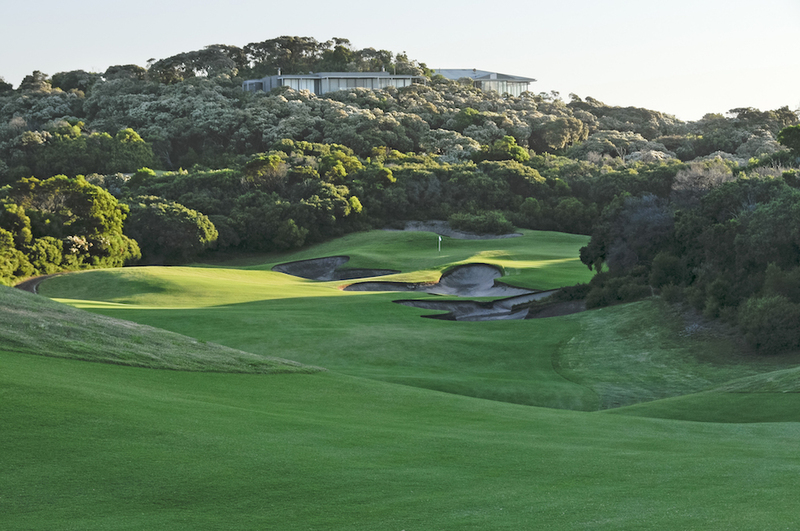 Robert Trent Jones Jr.
Australia’s largest private golf facility, The National Golf Club, began as a pipe dream in the early 1980’s when Melbourne entrepreneur David Inglis decided to build an exclusive golf club in the rugged Cape Schanck hills overlooking Bass Strait. 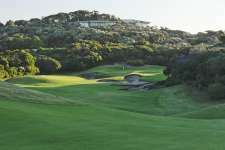 Golf had been played on the remote locale for more than a decade and the Inglis plan was to redesign the financially stricken Cape Country Club course for members and add a further 18 holes for public players. Wanting an overseas designer to build the new courses, The National initially had a commitment from Pete Dye which fell threw when Dye refused to travel to Australia to see the site first hand. 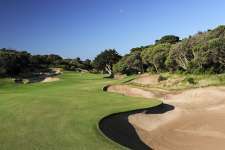 Other designers were considered but American Robert Trent Jones Jr. eventually selected, mostly on the back of his great work at Joondalup in Western Australia. Upon first inspection of the site Trent Jones was blown away by its potential and enthused that ‘any golf course architect would kill for a piece of land like this. It is one of the most unique areas of links country left anywhere in the world’. His master plan for The National required the total demolition of the existing course and the introduction of a prestigious residential estate within the clubs boundaries, with the land sales helping to fund the project. Built on a hillside 80 metres above sea level, the course was dramatically crafted through the rugged coastal tea-tree and offers stunning ocean views on sixteen of the holes. 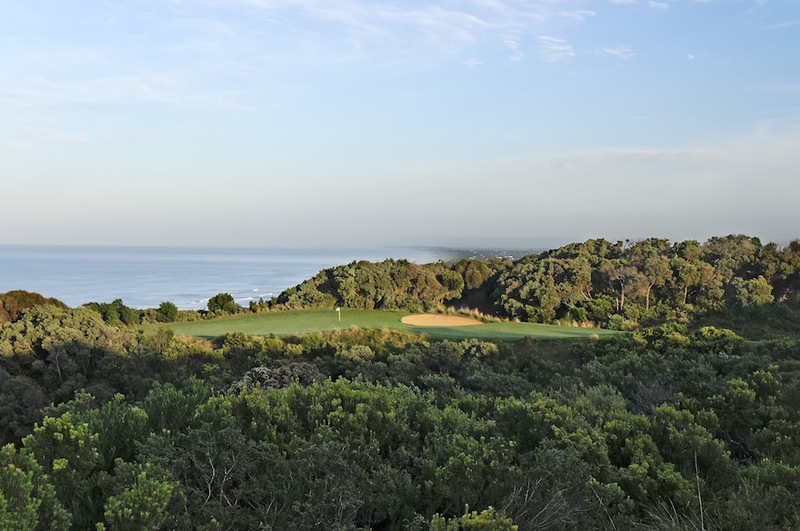 These stirring views together with the constant battle against the harsh Cape Schanck elements define the experience with The National ‘a lion in the wind or a lamb on a clear sunny day ‘ according to Trent Jones. Critics of the course tend to find the sharp bunkering, tiered landing areas and thick scrub surrounding the fairways a little too penal, especially in all too frequent high winds. Members though enjoy a wry smile when their beloved course is criticised as most that leave apparently unsatisfied with the severity of the challenge, invariably supplicate members for a return game. It’s my guess that detractors have only played the course as a lion and never enjoyed it as a lamb during the magically calm, clear Peninsula days when the birdie chances are flowing. To fully appreciate the genius of the Trent Jones design and understand its idiosyncrasies, the course has to be played several times and in a range of weather conditions. The slippery greens are probably Australia’s most extreme and can take years to master with the sharp ridges, steep tiers and frightening speeds making putting adventures both exhilarating and soul destroying at the same time. To quote putting prose - Before you putt from the roof of a Volkswagen and try to stop the ball on its bonnet, you should practice on the greens at The National! The spectacular par three 7th is the absolute highlight of the course and perhaps the entire Peninsula. From the tee the view extends past the outcrop green site to the crashing waves of Bass Strait, along the Peninsula and even out to Melbourne’s Port Philip Bay and city skyline on clear mornings. Played with anything from a wedge to a two iron, the tee shot must carry a wild jagged ravine and land softly on a wonderfully built green almost 80 metres wide but only a few metres deep. Anything short, long or wide here is dead but everything else is fine! If you have never played the hole it is worth travelling from wherever you read this review just to experience this breathtaking work of art. When the club expanded to 54 holes a new centralised clubhouse, built to accommodate golfers from each course, forced the reconfiguration of Old Course holes and considerably altered its character. The terrifying 14th, 15th and 16th became the opening holes and though built to test players coming home they can now destroy the scorecard before the golfer has even warmed up. The exhilarating outlooks from virtually every corner of this course are a powerful reminder of golf’s ability to stimulate the senses and although now referred to as the ‘Old’ course, ‘Original’ would have been an equally appropriate caption, so unique is the experience. While the visionaries did a wonderful job building a thriving club so far from a major city, it remains Trent Jones who put The National on the map with a dramatic golf course, unlike any other in the world.